OxySync is a handy solution to keep your mobile phone, smartphone and PC personal information synchronized. Application offers mobile contacts synchronization with Microsoft Outlook and Microsoft Exchange Server. 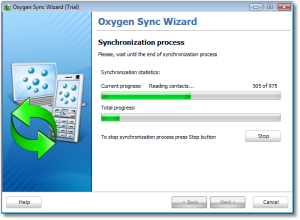 OxySync is designed as a convenient and easy-to-use wizard that will guide you through the whole process of synchronization. Application has one-click synchronization feature that starts the process with previously used settings. ...... The sync process duration mainly depends on the number of the contacts you have and usually takes only few minutes. Application has one-click synchronization feature that starts the process with previously used settings. In every point like this OxySync saves your time for much more important things, eliminating the problem of synchronization forever. OxySync supports Nokia, Sony Ericsson, Samsung mobile phone and smartphones, Windows Mobile 5/6 smartphones and communicators, BlackBerry and Motorola smartphones. OxySync software works under Windows 7, Windows Vista, Windows XP, Windows Server 2003 and Windows 2000 and supports USB cable, Bluetooth (Microsoft, Widcomm) and infrared connection using IrDA stack. Qweas is providing links to OxySync 1.1.0 as a courtesy, and makes no representations regarding OxySync or any other applications or any information related thereto. Any questions, complaints or claims regarding this application OxySync 1.1.0 must be directed to the appropriate software vendor. You may click the publisher link of OxySync on the top of this page to get more details about the vendor.